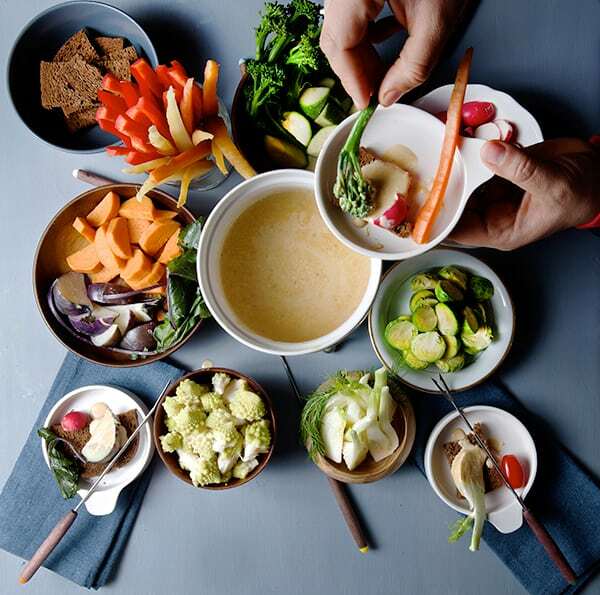 Creamy Bagna Cauda & Seasonal Vegetables ~ Yes, more please! 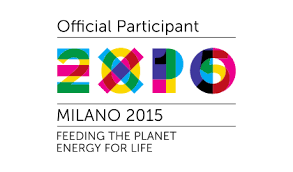 Bagna Cauda, is a traditional dish from the North region of Italy, Piedmont. 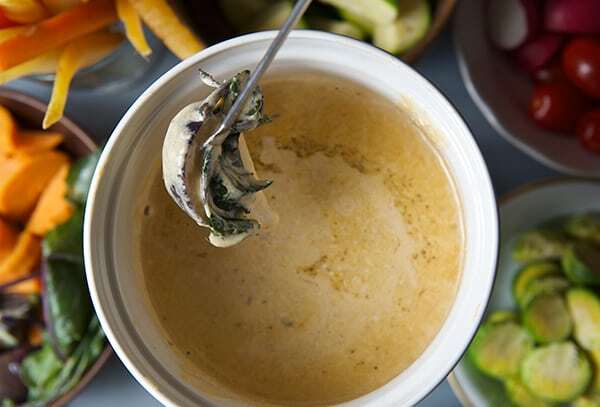 Bagna Cauda, literally means “Hot bath”. It is served in a similar way as fondue. It is a warm dip made with Olive Oil or Walnut Oil that it’s heated with generous amounts of garlic and… please do not panic when you read this, I promise you, that when you try this recipe you will fall in love with the abominable ingredient “anchovies”. Me, I’m not afraid at all, I’m an anchovy lover, but I know that there is a lot of people who is even scared by the word. Not even to mention the profound and terrified feeling if they know they are an ingredient in their food preparation, and some people might off gone into strike if they have to touch them. Well,what can I say?… give anchovies a chance. 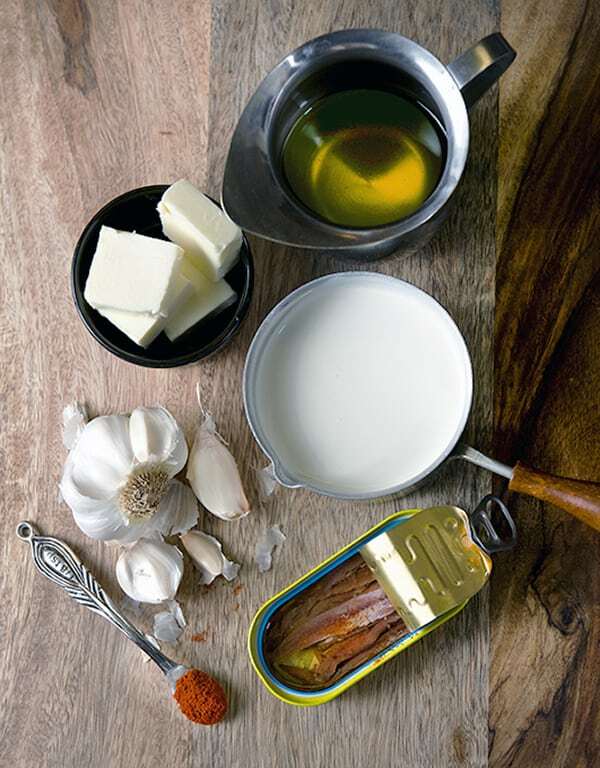 Anchovy flavor when is paired with different food and use as condiment to enhance deep of flavors in sauces or stews, acts as a salty umami background flavor. It gives a salty and nutty note that can bring any sauce, salad dressing, marinade or stew to a whole different level. No fishiness or crazy smells. And particularly in this warm sauce, it brings the punch of flavor to the tub party!…. Now, who is taking the bath?…Vegetables, any vegetable raw, steamed, roasted, “ a n y “ vegetable you like. 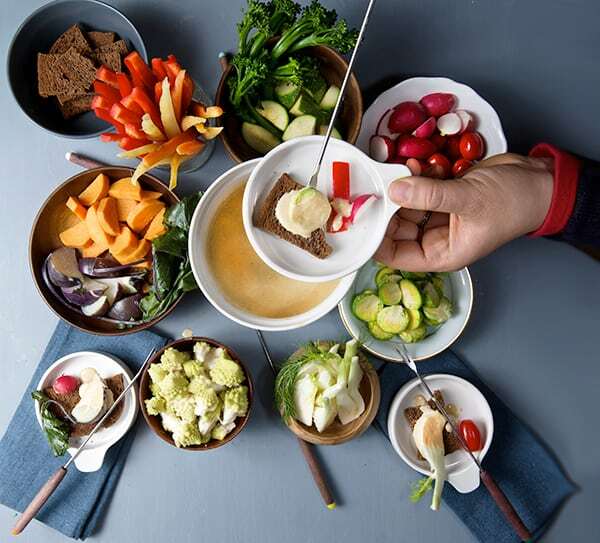 The best way to serve it is keeping the dip warm, I usually use a ceramic Fondue set with a tea light underneath, and serve the warm vegetables in separated plates or arranged in a big platter. Cutting the vegetables in bite size is a must so they can easily be reheated when drenched into the dip. Slices of crusty artisanal bread are ideal to complement the creamy sauce. 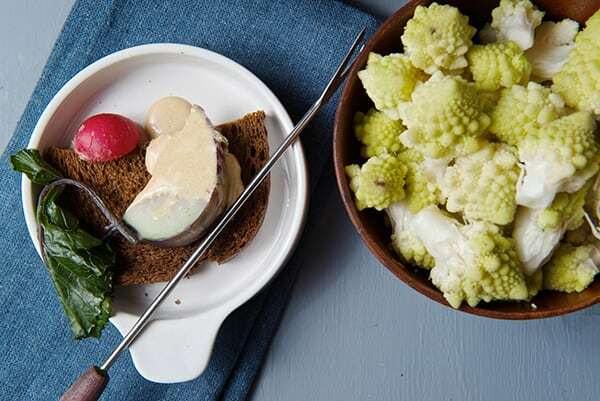 There are two ways to prepare Bagna Cauda, the oil route or the creamy route, I like the creamy version for fall-winter cold weather, because is richer and it goes great with the wintery seasonal greens and root vegetables. The Extra Virgin Olive Oil or Walnut Oil version works great for the summer months when you want to eat something lighter, and in my opinion, the summer seasonal vegetables pair magically with the olive oil. 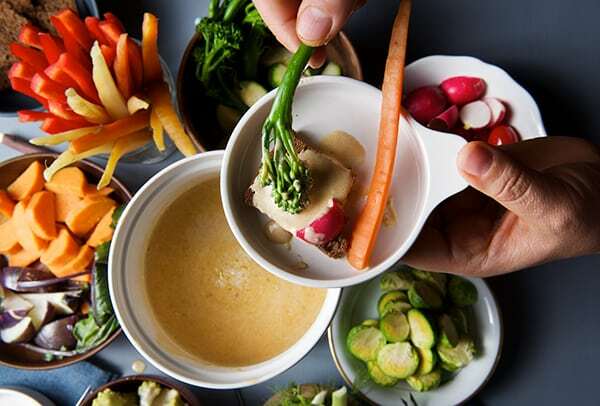 This recipe is great for parties, or for an easy light dinner, Ian and I we usually try to have a vegetable night during the week and this Bagna Cauda it’s fun, easy to prepare and really fulfilling. Give it a try, I will advice you that If you are experimenting for the first time with anchovies, start shy, it is a bit of an acquired taste. But if you already love them kick it up! you gonna love them even more!. 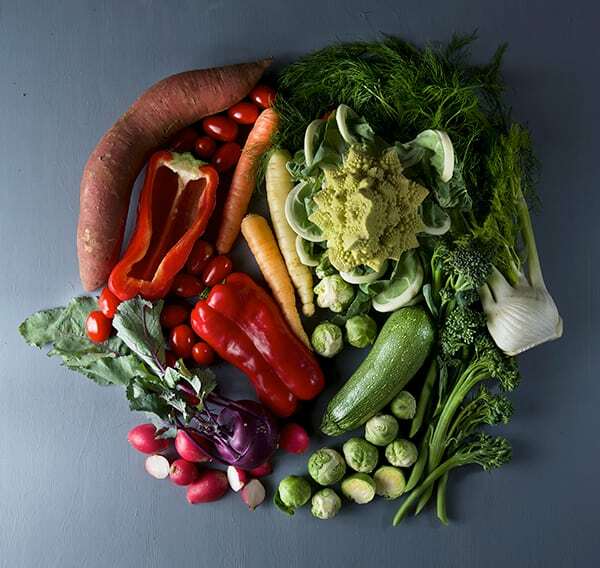 About the vegetables, honestly you are the one who is in charge, go to your farmers market see whats in season, try something different one vegetable at a time, chose some veggies you are comfortable with, so you don’t end up giving up. Trying many new flavors at once can be overwhelming. When choosing your vegetable assortment apply the colors of the rainbow, sounds silly but this will ensure you to have a great variety of flavor, texture, vegetables that taste better raw versus cooked and it will bring a great visual interest to your table… because in the end if it looks good you are more likely to eat it. So have fun! Ah!… I almost forgot, this is the last recipe of the 2013, thank you so much for all your support! May this year bring the best in you. Serves 4 people for dinner or up to 12 as an appetizer. 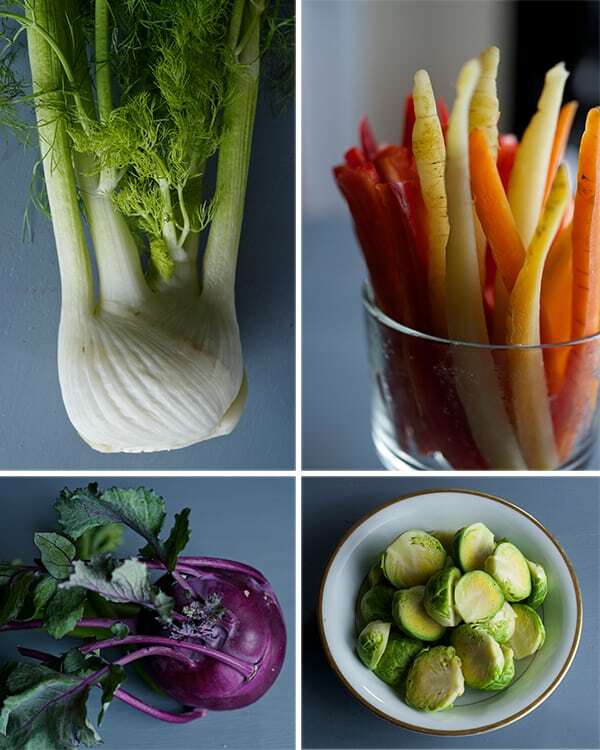 Romanesco Cauliflower, sweet potato, kohlrabi, fennel, carrots, brussels sprouts and radishes. I complemented with some store-bought staples like grape tomatoes, zucchini, red bell peppers, broccolini. Cherry tomatoes, any heirloom tomato, sweet red peppers, cucumber, sweet peas, green beans, wax beans, zucchini, carrots, eggplant, asparagus, green onions, mushrooms. In a small sauce pan, using low heat warm the Extra Virgin Olive oil, grated garlic. Add the anchovies fillets and with the help of a fork start mashing the anchovies until almost disintegrated. Add lemon zest, black pepper. Add the butter and when is melted add the Heavy cream. Add paprika , lemon juice and cherry. Whisk until combined and warm. Do not let it come to a boil. Transfer into a ceramic dish and keep it warm using a fondue set or a small warmer. 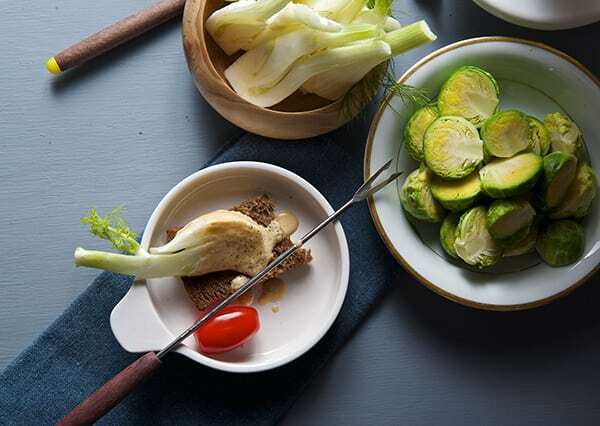 Cut your vegetables in bite sizes, sticks or wedges, serve them raw, steamed or roasted for variety of texture and flavor. Raw vegetables: Tomatoes, celery, red bell peppers, radishes, fennel. Serve with some slices of artisanal rustic bread. A glass of Prosecco or Pinot Grigio with citrus notes will pair great with this dinner.Enjoy!